As the fair kicks off at the Kingdom the leaders of the four communities assemble to heal old wounds and forge a new alliance -- while Alpha makes a deadly move to reassert her dominance. Last edited by GateWorld; March 25th, 2019 at 11:13 PM. Ozzy - The newly introduced Highwaymen boss. He was too new for me to care about, but it seems like a ton of wasted potential to kill him off this quick. J.D. - Meh. Glorified background character, not at all sorry to see him go. Tammy - Will admit, I was a bit surprised by this one. I don't know that there was much more story for her, but I was surprised to see her head up there just the same. Rodney - I didn't even know this little s--t's name until tonight. Addie - I only vaguely remembered this girl from a while back. Enid - Genuine surprise. I thought Alden would go for sure, so...good for you for surprising me, TWD. Tara - PARTY!!!!! I have hated Tara ever since her first episode. I am thrilled she's dead! Henry - ...wow I did not see that one coming. Show's pretty dead set on abandoning all the Carl storylines, isn't it? Definitely a few surprises, which is an unexpected pleasantry nine years into a show. But on the whole, not quite the dramatic moment I was hoping for. Last edited by DigiFluid; March 24th, 2019 at 07:02 PM. He was my favorite character so far this season... always loved that actor and man it's such a shame! This is literally the only guy that I cared about. Was that the old lady? I think she triggered Alpha with that baby. Yea, same, his buddy and him were playing the high school bullies. Don't care about that one. I literally hated her since day 1. Good riddance. Didn't we talk about her like last week?!? Man I was ecstatic when she died ha! It literally made me smile and giggle when I saw her head on that spike. Hate that actress, hate her snobb attitude, and hated her character. I celebrated the whole thing with a cold beer, was worth it. I was actually fantasizing she was going to be written out a couple weeks back, saw her on Talking Dead and she didn't seem in the mood at all (unsurprising) and also her acting was way off in this episode. Even more hilarious since every time I saw her give interviews about the show, she gave that impression that she was one of the main characters and spoke very highly of herself and she just got Gimpled so hard. Yea I guess so, although I didn't really care about him either. Good guys don't survive long in this show. lol also Hardwick said many people had DVR issues (Not myself) and didn't record the last 25 minutes. How the f*** did Alpha smuggle all those heads out of the Kingdom unheard and unseen? How did she get her crew in that barn where she chained them all? And holy guacamole was that ending cheesy! *But we fought back, and...* This made me think of those 80-90s movies where you see the heroes fight until their dying breath, taking a few with them. So, guessing from the comments this happened at different times? Slightly confused how it all got put together. But I must say, I was not expecting this at all... I had a hard time recognising the faces, came here cause I knew you guys would say who it was. Shame about the old lady, Enid too, didnt really realise it was Tara till I came here, didnt really care for her but the one suprise was Henry! Looking back now there were comments that kinda suggested who might go but I was expecting Ezekial to be the final head, doesnt he go down here? Also, guessing this is the borders story you were talking about? I'm guessing you're talking about the comics Teddy, Digi might have your answers I'm not reading them. The editing was horrible and I understand your confusion, I am also. What I pieced together is the moment where Alpha talks to Daryl and shows him her collection of Walkers is the ''after'' her killing spree in the Kingdom. Still so many unanswered questions though (Like how did they pick them one by one, I have no clue and it's not shown really). A part from the nobodies that died we've got Enith / Henry / Tara basically, Tara being a choice death for myself in particular, I think I'll forgive the confusion and bad editing for that alone. Yes, this is exactly the 'borders' story I was alluding to in previous threads. Exactly. I just thought it would happen in the finale, not the episode prior. The comics are uh....a bit darker. We're effectively at Issue #144, if you want to see specifics of how things are different. About the border threat in specific, Alpha tells Rick the same thing she tells Daryl in the comics: cross our border, and I'll unleash my herd on you. Not long after, they come across the border pikes. In the comics it's 12 rather than 10, and includes a number of comics characters you'll not have heard of (Josh, Erin, Ken, Larry, Oscar), some you have who have met different fates on the show (Olivia the inventory manager from Alexandria, Carson from the Sanctuary, Amber who was one of Negan's "wives"), and then the big ones: Tammy (the older lady), Luke (the bearded guy from Magna's crew), Rosita (also pregnant at this point in the comics), and Ezekiel. Last edited by DigiFluid; March 25th, 2019 at 11:51 AM. 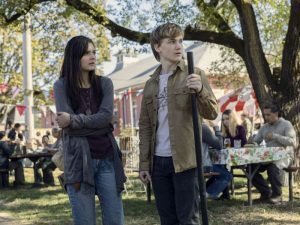 Ahh, Id seen an article with the guy who plays Ezekiel talking about the fair and the fact he died in the comics at that point but hadnt clocked it might be this fair till the episode aired. I was thinking a fairground for some reason. It's pretty much been established since the beginning that events in the comics do happen on screen but with different characters involved. Well, yes. I just think that -- even though I'm enjoying the show more than I have in years -- they're kind of straining with how to adapt the storylines when they've killed off the characters on the show. Correct. Not sure if Tara's death was his doing, I assumed so since he was the one doing the talking on Talking Dead Sunday. Somehow they kept hinting on TD that Tara was going off with her family, but I think something else happened since she wasn't there to talk about it AND that her acting was so bad on that last episode, looked intentional. Tara got Gimpled. Happy Chaka is Happy. Why were the Ancients so calm and why didnt the expedition know about the panel?